Co -production Teatro Real and Teatro alla Scala, based on the original from Théâtre du Chatelet. Grand Mother Burya: Mette Ejsing. It is curious what has happened to Janacek's operas in recent years , both in general and with Jenůfa in particular. In the last 6 years I have had the opportunity of attending 5 different productions of this opera and every one of them has been invariably been a success. Not all the productions have had the same musical, scenic or vocal qualities and yet, each one has been the biggest success of the opera seasons involved. It is difficult not to conclude that the common element in this phenomenon must rest on the fact that Jenůfa is one of the best operas in the history of lyric theatre. This introduction is also validated by confirming that the Jenůfa just seen at Madrid's Teatro Real is a new success, as were the Madrid Kabanova and Makropulos in the past two years. It has notably raised the temperature in the house, after a not too happy start to the season. Things worked well here in every respect and the audiences were not wrong in their final responses to the production. The production was originally premiered at the Paris Chatelet in 1996 and revived 6 years later. Later still, the production was bought by La Scala and the Teatro Real and I assume that there must have been some changes to it, although the photographs I've seen of the original don’t show them. After being presented two years ago and with great success at Milan, Stéphane Braunschweig's fashionably minimalist version achieves the same standard once more but in Spain. The big difference with other minimalist stagings seen at the Teatro Real is that Braunschweig’s directing is very good indeed. A minimalist production needs a lot of intervention by the director as well as outstanding lighting, particularly in the interior scenes. Both were very well achieved here. The sets consist of simple movable walls, opening and closing for different scenes and creating an appropriately oppressive atmosphere throughout. Apart from that, a few very significant props; a rosemary plant, a cradle in Act II, some benches that represent a church in the last Act and a windmill sail (almost another of the protagonists for this opera) are the only representations of different settings. The costumes move simply between white and black and are invariably appropriate. There is excellent lighting too. But the stage direction is remarkable, helped along by singer/actors who are genuine specialists in their roles, and more than decent management of the crowd scenes. And what is even more important is that Braunschweig's work is always at the service of music and libretto with the result that real emotion is transmitted to the public. For me, the great triumph of the evening was scored by the English conductor Ivor Bolton. Until now, I had invariably seen this excellent maestro in pre-19th century repertoire and had found his performances always outstanding. But here, and in a very different repertoire, his performance was simply exceptional. Not only did he conduct the score superbly, with extraordinary tension and sensitivity throughout, but drew some truly wonderful playing from his orchestra, significantly better than anything I have heard from them under other batons. The vocal distribution was excellent for the first cast and not at quite the same quality level for the second. 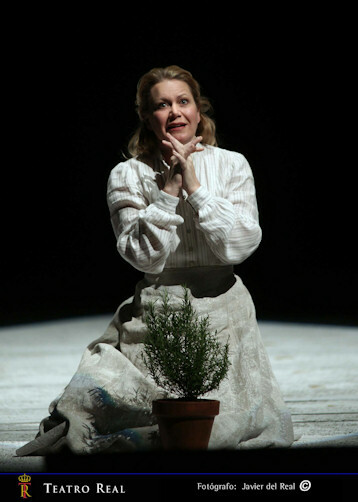 The English soprano Amanda Roocroft was an exciting Jenůfa, more focused on the character than she was a few years ago in Oviedo. Jenůfa must genuinely move the audience and in this Ms. Roocroft succeeded completely, since pure emotional expressiveness is the most important element in her interpretation. This soprano, who had almost risen to stardom before her professional debut in the late 1980s, has not had quite the career that was anticipated then, but it seems that in recent years she is flying high again in works by Janacek and Britten in which she clearly has found her best field. Her attractive looks also make her an ideal Jenůfa on stage. Vocally, she can be a little light at the the more dramatic moments, with a top register that is not especially bright but the beauty of her middle range and her gifts as an interpreter more than compensate. All in all she is an excellent Jenůfa. In the second cast Jenůfa was the Slovak soprano Andrea Dankova, who also offered a fine interpretation. She too is rather light for the most dramatic moments, but the big difference between her and Amanda Roocroft is that Ms Dankova does not have the same capacity for transmitting emotions that Ms Roocroft does: this makes a huge difference between their interpretations. The Kostelnicka is one of those characters requiring a real stage animal and is often as not offered to an old glory. This can make good sense, considering that she is the adoptive mother to Jenůfa but the difficulty is always that older interpreters' voices are sometimes past their best. The last Kostelnicka in Madrid was none other than Leonie Rysanek in 1993, when she was certainly not at her peak, but was still in a remarkable vocal shape and could produce a memorable performance. This time the Teatro Real opted for the American dramatic soprano Deborah Polaski and her interpretation was also outstanding. She is not precisely in her vocal zenith, but she is still a great singer and a great actress. She keeps an enviable quality in the centre and only the high notes are rather strained. Along with the always remembered Rysanek this was the best sung Kostelnicka I've seen onstage in many years. The veteran Anja Silja was the Kostelnicka for the second cast. She proved - if proof were necessary, that she is still a great actress, but her voice has indeed seen better days. Silja is of course an icon, worthy of homage from opera lovers for everything that she has done in her long career, but now not quite up to the task of singing the Kostelnicka. Even so, it was good to see her once again. The Slovak tenor Miroslav Dvorsky was a very good Laca. This is his best repertoire and his voice has real quality. The top is well-placed and he fully commands every facet of the character. The other tenor, Steva, was played by the Austrian Nikolai Schukoff, whose voice is more heroic than is usual for this character. He was a good complement to this outstanding quartet. The second cast tenors were clearly below their colleagues in the first cast although the Finn Jorma Silvasti was good except for his usual problem at the top of his range. The Canadian Gordon Gietz has always been a rather light tenor. Now, his voice is wider in the middle than it was, but unfortunately he has lost some brightness at the top and his Steva was of little interest, compared with Schukoff's. The secondary roles were all very well covered, without any weak points. Grandmother Burya was the luxuriously cast Mette Ejsing. Hungarian baritone Karoly Szemeredy as the windmill foreman was also excellent as was the Spanish soprano Marta Ubieta as Karolka. There was full house on both days with great enthusiasm for the first cast and sonorous cheers for Deborah Polaski, Amanda Roocroft, Miro Dvorsky and - last but not least - Ivor Bolton. In the second cast the cheers went only to Anja Silja and Ivor Bolton.